The start of a new school year can be overwhelming with so many details that need to be addressed within a short window of time. 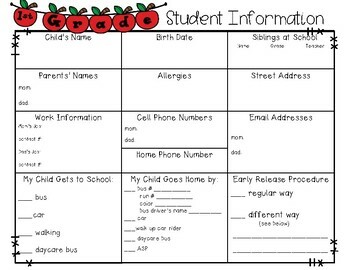 Having one page with all of your student's family information in an organized format will mean one less thing for you to worry about. 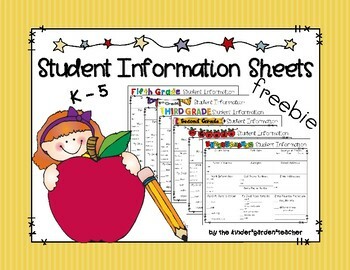 I give out this Student Information Sheet during Meet and Greet in August. Then, I slip the completed pages in sheet protectors (not included) and store them in a safe place in my room. 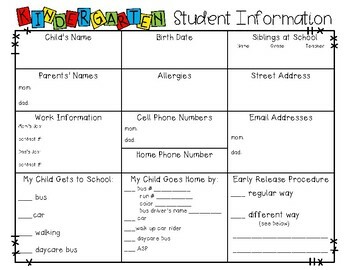 It comes in handy when contacting parents with good news and for looking up information such as bus numbers quickly. I hope you find this freebie useful.